The consolidated market share of Intact Media Group TV Division (Antena 1, Antena Stars, Happy Channel, ZU TV and Antena 3) during January-October 2017 appreciates on prime time (1%) and late fringe (4%) intervals vis-à-vis the same period last year. 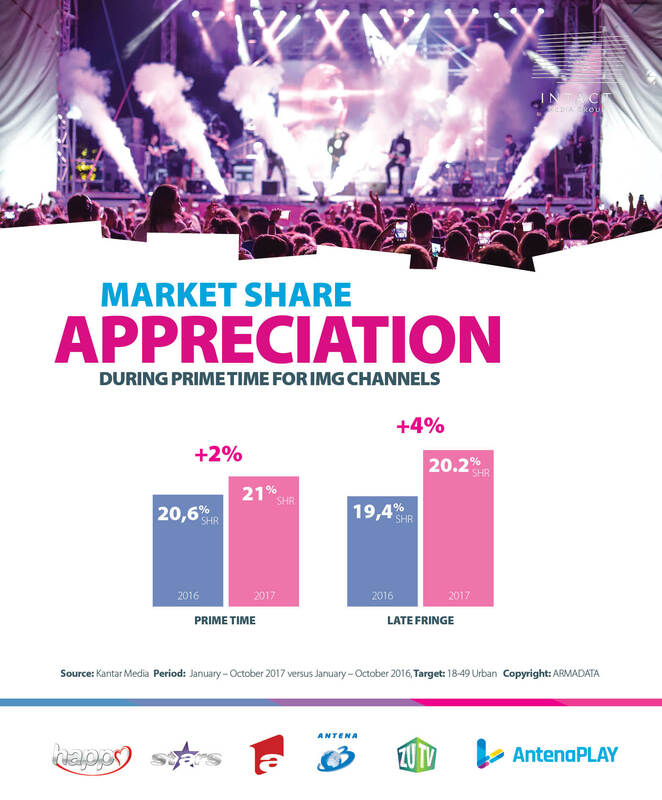 Antena 1, the flagship entertainment channel, home to the largest star system in Romania, appreciated its market share by one percent during Prime Time on the commercial target since the beginning of the year (January – October 2017) compared to the same period of last year. “Game of Chefs”, “IUmor” and “Baieti de oras” ( local produced comedy series) topped the audience charts in October. 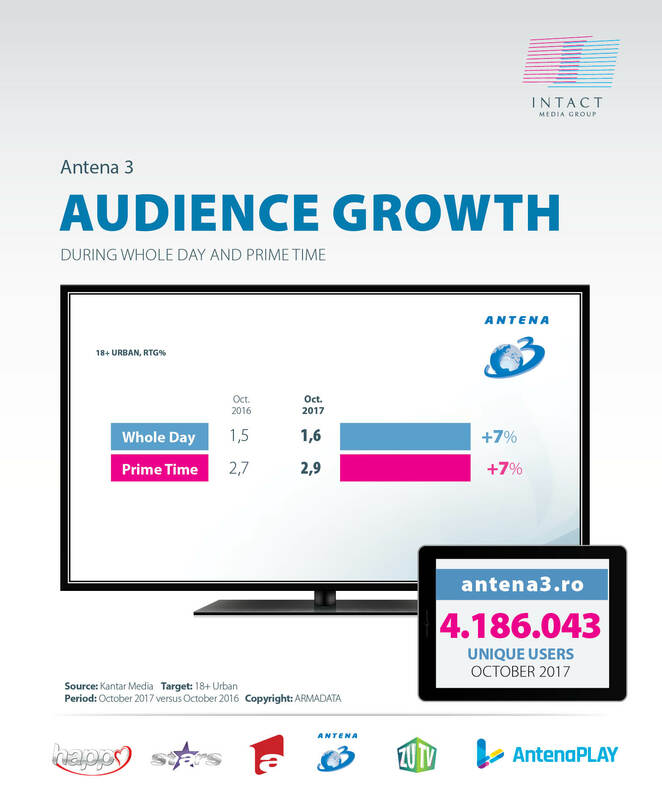 Antena 1 was watched in September, during Whole Day, for at least one minute, by 7.3 million Romanians, whilst www.A1.ro had more than 4.1 million unique users. 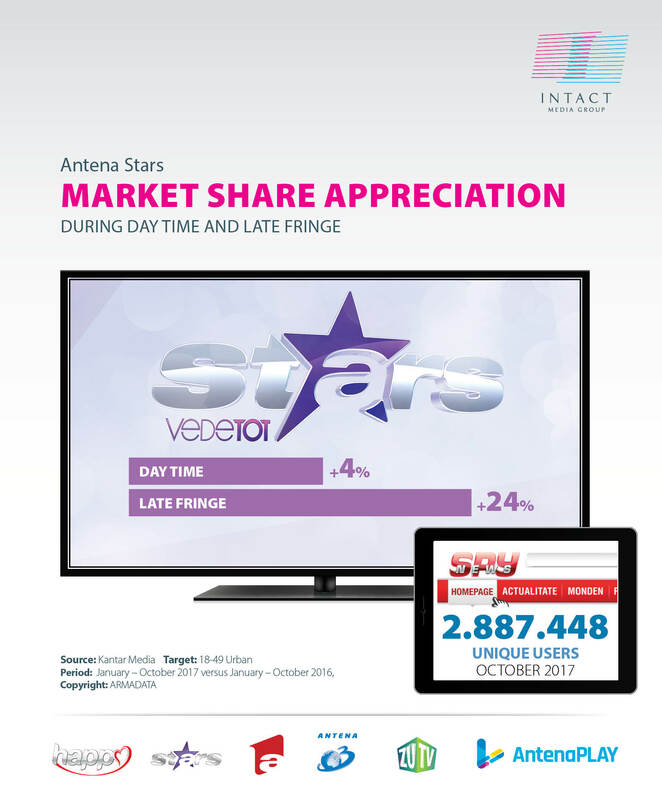 Antena Stars, the only TV channel dedicated to showbiz, had important market share growth during Day Time (4%) and Late Fringe (24%) and audience appreciation during Late Fringe (33%) in January- October 2017, compared to the same period last year. Almost three million Romanians watched Antena Stars in OCtober, during Whole Day, for at least one minute. The most popular productions were “Agentia VIP”, Rai da buni”, and “Refresh by Oana Turcu”. For Happy Channel, the Group’s TV station addressed to women, October saw the launch of the second part of the in-house series “O gramada de caramele”. Also, it brought a market share appreciation during Acces (10%) on the commercial target, compared to the same period last year. Alongside the new production, the most popular series of the station included “Iubire si razbunare” (Brave and beautiful) “Elif”, “Nord si Sud” (North and South). Over a million viewers watched Happy Channel every day, in October, for at least one minute on the National level. Antena 3 received a new international recognition at the AIB London Gala, where Mihai Gadea, anchor of Sinteza Zilei was awarded Anchor of the year. The distinction was offered by a jury of media professionals worldwide. Antena 3 appreciated its market share numbers significantly in October, leading the news niche on most of the time segments, amongst which Whole Day (9%) and Prime Time (6%). The news station leads in terms of audience as well, during the majority of intervals. At the same time, the audience and market share numbers have evolved since the start of the year (January-October 2017) as compared to the same period of 2016. The market share appreciation includes Whole Day (6%) and Prime Time (3%) intervals on the 18+ urban target. Antena 3 was watched in October by more than 3.7 viewers every day, on the National level., “Sinteza Zilei”, “Adevăruri Ascunse”, “Voi cu Voicu”, “In Premiera” were the most watched programs over the last month. On the digital front, Antena3.ro had more than 4 million unique users. ZU TV, the only interactive TV station in Romania,appreciates its market share on all time intervals in October. “Most wanted”, “Miezu”, “ZU Trends” were the most watched productions of the month. Digital Antena Group defined its strategy for 2018, where the focus will be on Data. Thus a new department was created –Data Management Center with specialists on research, analysis and SEO. Also, in 2018, Digital Antena Group will be able to offer Facebook and Google similar targeting by adopting DFP cXense and a change in the way audience is measured. In terms of figures, a1.ro and antena3.ro are in top 10 all sites in Romania. Gsp.ro and Spynews.ro had the most views from the Group’s portfolio last month. There were more than 250 million views in October in October. More than 9 million Romanians watched Intact’s family of TV channels in October during Whole Day, for at least one minute, on national level, while 6.818.000 were reached during Prime Time.